A good way to stretch your decorating dollar is to use what you have. This cabinet has a large wide area so I need to use large pieces up there to even be seen. I borrowed this chicken feeder from a friend. The bottom is rusty but I coiled a yellow garland around the base and pulled up the pip berries to be seen above the edge. The feeder would look good sitting on the floor as well and could have ivy or flowers as well as the garland in it. An old box I had lying around houses a variegated ivy bunch and had several old jars on the top of which only one remains. These jars were found discarded and we also picked up some at yard sales and flea markets. The wreath was another yard sale find and it was taken apart and redone to add interest. 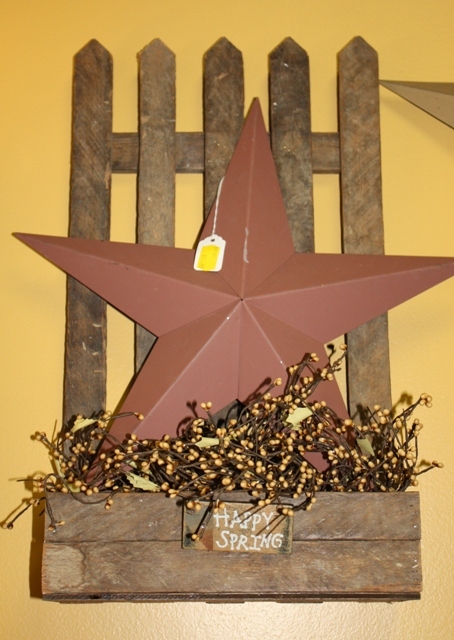 None of these items were expensive in themselves.. they were brought together and repurposed in an attractive display. This allows one to splurge on something like the goose decoy . It adds interest and pulls the colors together.. especially sporting a small yellow candle ring around its neck. This entire display could remain and the florals changed out to reflect the seasons. Ok, this is not the best picture, but again, I have used some everyday items to create a unique display. the speckled pots were pulled out of a cupboard and stacked to add height and be noticable on the top of this hutch. I turned a divided box on end to show my crocks, a pine cone from my Grandmother’s old house and an pretty blue bottle I found in the dirt somewhere. 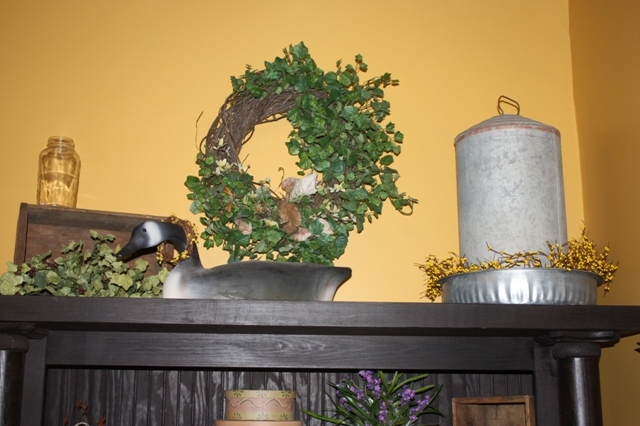 Added to this are garlands and picks in rich earth tones to pick up the colors of the crocks. The key to shoe string decorating is to keep one eye always open to the possibilites an item may have beyond what it was origionally intended to be. Do You Have a Great Idea..
Have you come up with a nice display combination? Have you repurposed an item in a unique way? I know I get a lot of inspriation from seeing what others have done and I love those ‘I never would have thought about that’ ideas I stumble across. Share your tips and ideas with others by sending them to me for posting here on our Blog. If I add them to the blog I will give you one of our highly scented and long burning candles at half price or a $5 gift card for the shop. And if you like the little bench in the picture, click the picture or HERE to check out the Etsy shop I found it on. Nice stuff.. her motto is “ Because a Womans Place is in the Woodshop”. I love it! I love information and reading. Both are combined in searching the internet. I was spending some time looking for decorating ideas, repurposing sites and generally any kind of info for those of us who are having to tighten up and make things stretch. My search led me to several blogs dealing with Goodwill finds, crafting and being frugal. I find I enjoy reading blogs as the tone is conversational and you feel like your hanging out with one of your friends. Here are some of the sites I found interesting while searching. Suddenly Frugal – a cool blog with a lot of info. There are Freebie Fridays with info on free stuff from retailers and restaurants, information was given on where to find the best shopping deals during the holidays and there is lots more. I found this blog a bit later in the evening and was a bit too tired to fully explore. I plan on checking back regularly. 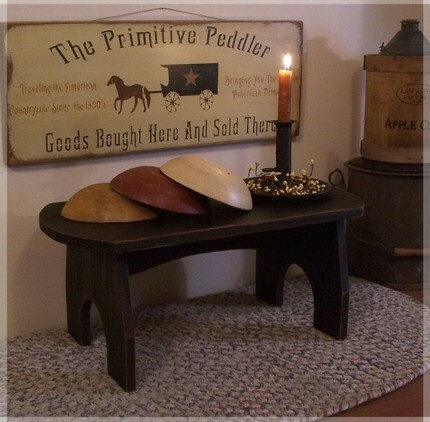 Primitive Lifestyle – This blogger is in Ohio and loves to hit the Goodwill store and repurpose items she finds. She posts the latest treasures and will later post her project to change the item into a new piece for her home. I enjoyed going back through the archives to see all the neat items she has reclaimed and given new life to. Though I too love to redo items, she has inspired me to look at things a little differently to find the hidden treasures. Behind My Red Door – OK.. not really a lot of How-To-Do.. but the pictures are delightful eye candy to those that love the country/prim style of decor. Cruising thhrough her posts gave me ideas for decorating the shop. Sometimes the bets way to save money on decorating is to get some free inspiration. Enjoy..
As stated in the earlier post.. I like to get inexpensive little containers like boxes to use in my decorating. Often old boxes can be found for a few dollars a piece and the beat up nature of old boxes in general lends itself very nicely to country and prim decor. Take this little green box, for instance. It is a reproduction but it is made to look like a little drawer from a spice box. This box actually has a hook on the back for hanging on the wall as well as sitting on a shelf like it is here. 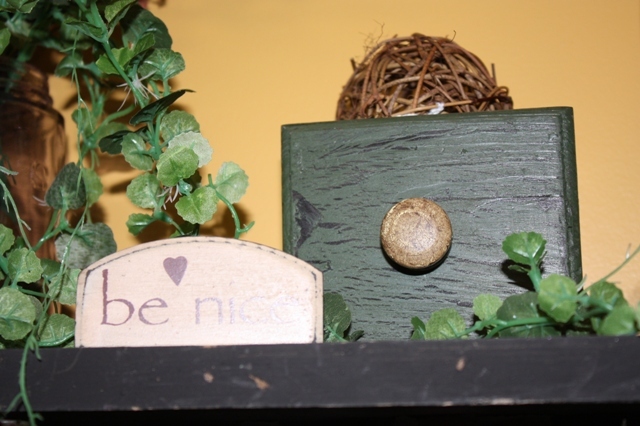 We have put all kinds of things in it and right now it is home for a twig ball. The rounded ball plays a nice complement to the little wood block’s rounded top and the box’s round pull. The square shape of the box is a sharp contrast to all the other spherical shapes in the arrangement. A nice floral pick with trailing stems ties the green color of the box to the arrangement and of course it softens and ties it all together. This is my new favorite treatment of small rectangular boxes… masses of pip berries! We have some great, thick pip berry wreaths that I have been scrunching together and putting in boxes. The pip strands are long enough to pull up above the top of the box and the thickness of the wreath makes a very full effect in the box. 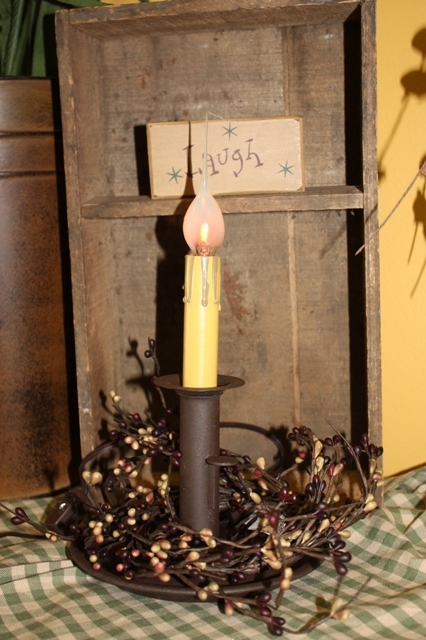 With this little box I added a mini candlestick light. Is that not the cutest way to display a light?? Instead of the candle stick light try adding a small strand of christmas tree lights or the popular mini rice lights. Those tiny lights look darling in among the berries. Once again I have taken one of our pip berry wreathes, this time a mustard color, and flattened it sideways to fit in this box. You can see how thick and full the berries are in the box. This box has a neat rustic fence behind it that just begs attention. I stuck a star up there for no reason other to get the star up where it could be seen. I can see this box with some nice ivy trailing over the side and up the fence and some spring colored florals added in for color. Or add some brightly colored eggs or a cute little rabbit and you have a seasonal piece for your wall or table.. and it could be easily changed for the coming seasons. The texture of time-worn boxes can also be used to set off other pieces. This candle stick is fairly new. We added a candle ring to dress it up and then put this unique box behind it duplicate the tall vertical feel of the candlestick. 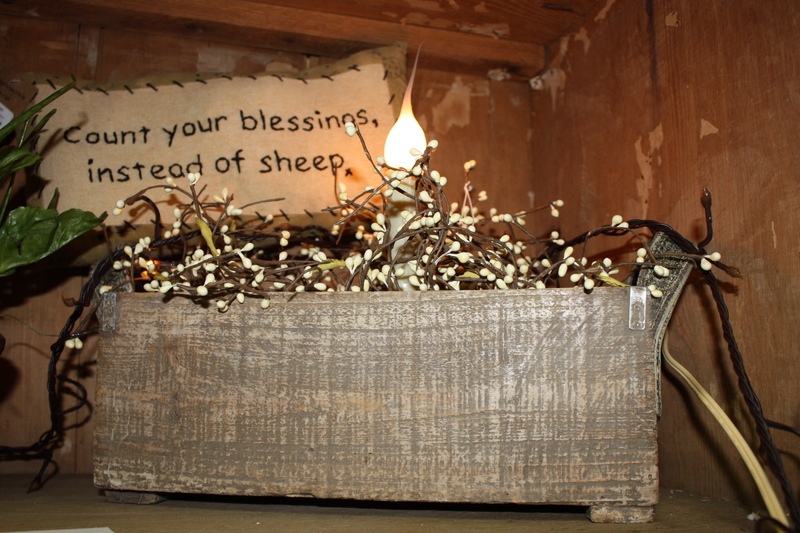 And of course, the beat up box adds to the rustic finish of the candle. The compartments in the box are a nice place to tuck little things like a wood block or a small picture. Boxes are also very useful for adding height to an arrangement. A well placed box with items on the top help to draw the eye up without drawing attention to themselves. This reason in particular is one of the best for having a collection of boxes to use in your decorating. And.. the best part.. is they are usually cheap and easy to come by so having several will be easy on your purse. First thing to do is look around for the free ones. My grandmother had several in her garage. A cool old box with items to repair shoes in it and several long, shallow boxes with compartments for screws, bolts and what have you. A quick scrub and her trash became my new found treasure. I have picked up boxes at auction for just a few dollars each. Even larger storage boxes with hinged lids can find use to get items up off a floor and to add visual appeal next to a table or hutch. Happy collecting. If you have ever watched HGTV, you will soon see that ‘Staging’ a room has a lot to do with its appeal. When you buy a candle, or even use a warmer, there are things you can to do maximize the fragrance distributed around your home. Here around the shop, safety is a big issue. I had all my testers up high on the tops of cabinets. I went through a stage where I thought I was getting some real duds as samples. Since more often than not I pay for these, I was getting a bit aggravated. Then, I climbed up a ladder to get something off the top of a cabinet for a customer and wow!! the air up there smelled wonderful. I was not thinking when I put the testers up so high. The candle produces heat that melts the wax. As that heat is carried up, so is your fragrance. We now have our testers placed lower in the shop.. below nose level. We have had to choose these locations carefully because of children coming into the shop and the tendency of people to pick things up when buying. Now they are on lower shelves that as a rule, don’t carry much merchandise and hidden to not attract the attention of kids. Plus, we have Bruce to entertain the kids as well. So, around your home, if you are burning a candle, look for a location that is out of the way and below nose level. Our best fragrance is from candles placed about knee high here in the shop. Another lesson I learned in Texas. I had a candle placed on a table next to my recliner. I could not smell it in the living room.. however, in the hallway, it smelled great. After thinking about if a bit, I realized that my air return vent was in that hallway and affecting the flow of the fragrance. When the system kicked on, it pulled air from the end of the house, into the hall and vent. Moving the candle further away from the vent pulled that fragrance through the room and I had better distribution of the fragrance. We use that here at the shop as well. Air is pulled from the front to the back. Testers are place so that the tester is actually in the area I want fragranced, furthest away from the back of the shop. That way, when the unit kicks on, the scent is pulled into the area I want to smell good. In your home, when you want to fragrance a room, place the candle or warmer furthest away from your return vent and you will have the best results. What do you do with these old home that have return vents all over the place? My living room has 2, a return in the floor on opposite ends of the room. so, I place my candle in the center of the room on a coffee table. The vents pull the fragrance through the room and the placement level allows the fragrance to travel up through the room. 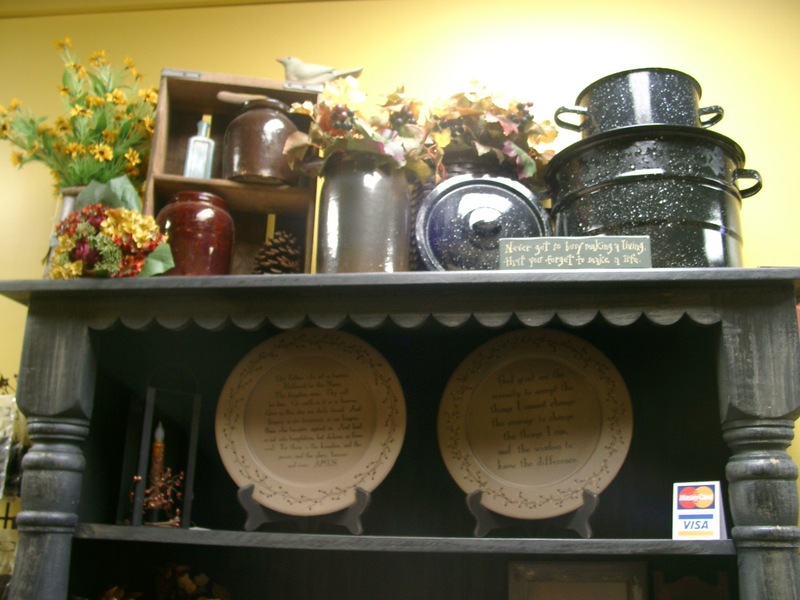 When you buy a candle or wax warmer, you are wanting to bring fragrance into your home. Maximize the effect by placing the candle so that you get the most from it.